British consumers are leading the planet in a relentless march to switch all their shopping online. Britain is the No.1 country for online shopping. Right now, 29% of all shopping done by credit/debit card is done online in the UK. It was only 17% in 2011. British people currently spend an average of £1.2 billion online every week, up more than 10% on last year. At this rate, 50% of all shopping will be done online by 2030. By the time you read this you will probably (hopefully) finished all of your Christmas gift shopping, so you will already know at some instinctual level that online shopping once again took a sizeable chunk of all retail activity. There isn’t another trend in all of economics that is as astonishing and predictable as that upward pointing line. Even if you mentally discount the slope to account for the way Barclays begins the y-axis at 17%, it is still one of very few macroeconomics charts for which there is only one possible interpretation. 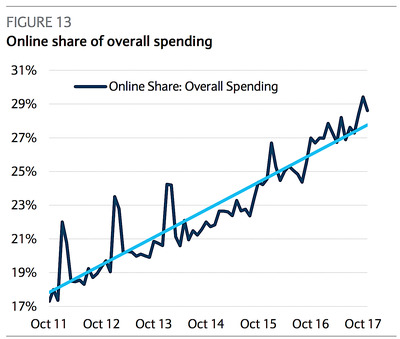 Online shopping is gaining more than one percentage point of market share per year. It suggests that by about 2030, half of all purchases of all kinds made by card will be done online. British people currently spend an average of £1.2 billion online every week; up 10.2% to last year, according to the Office for National Statistics. And, of course, you don’t have to endure the crowds at the mall.